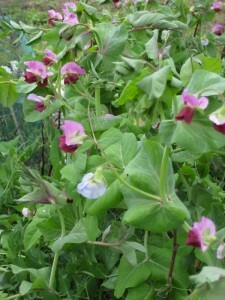 10th July 2011 – Allotment Plot 326 – Harvest: Peas Ezeta’s Krombek Blauwschokker = 5oz = 150g, Oregon Sugar Pod II = 5.5oz = 160g, a mix of Kelvedon Wonder, Ambassador and Meteor = 1lb 3oz = 550g. 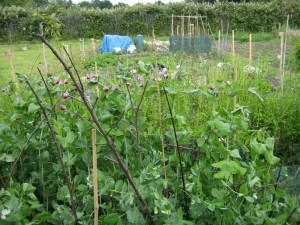 12th July 2011 – Allotment Plot 326 – R&P helped to erect some of the fence around the Plot. The first gate was placed in position. 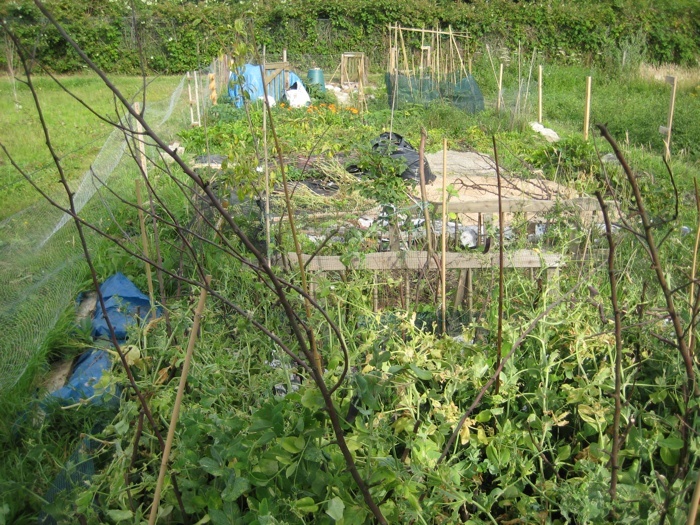 The fence that was being erected around Plot 326 might suspend the rabbits from eating any plant they desired, but it would not deter the growth of unwanted plants. 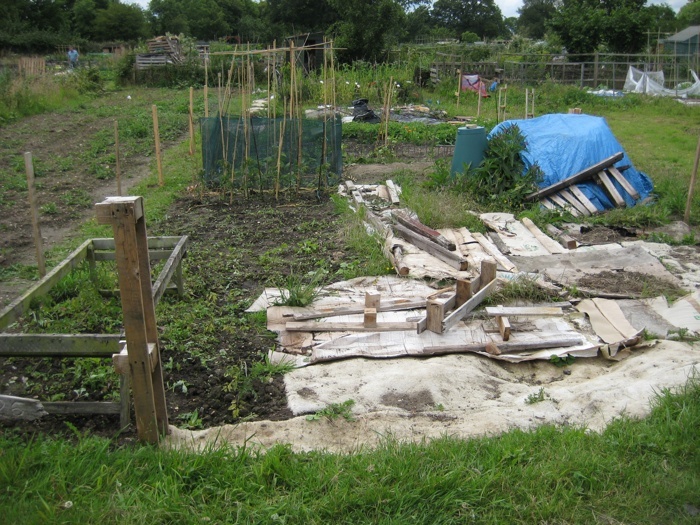 A new allotment holder had moved in to the plot next to 326 and placed carpet off-cuts on the soil to try to hinder the growth of unwanted plants, such as the brambles. Some seeds can live in the soil for many years before they germinate. It is a slow process to eradicate perennials and is better to calm their growth by not allowing the seeds to spread over the Plot. 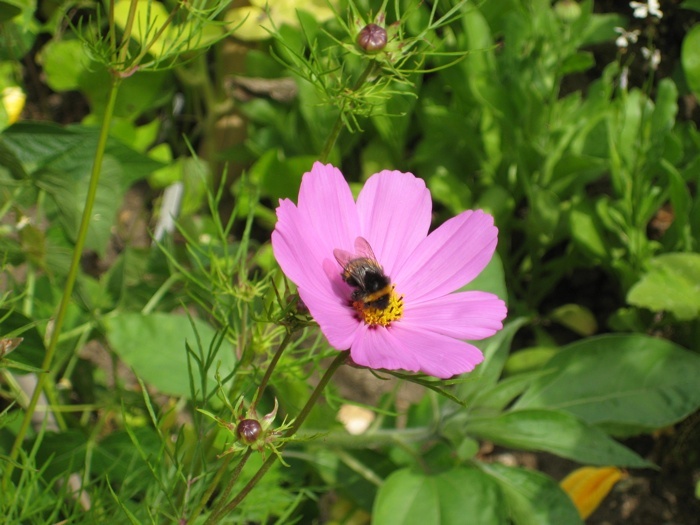 However many plants that are considered weeds can be beneficial in all kinds of ways, by attracting biodiversity, acting as green manure, fixing nitrogen, activating compost or acting as food for the vegetable plants. 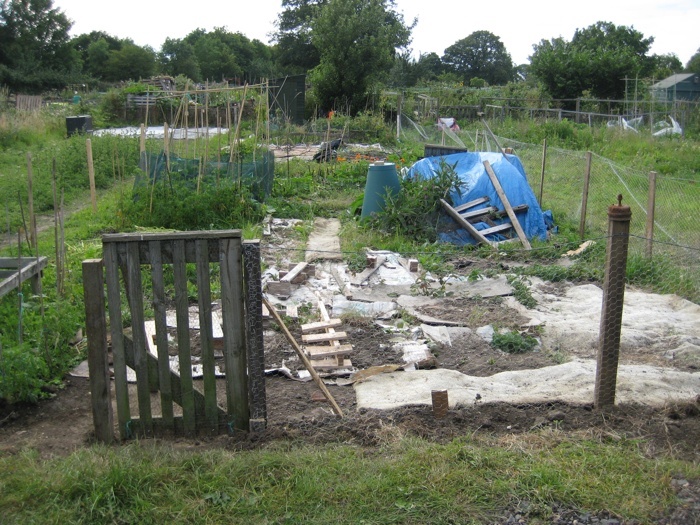 14th July 2011 – Allotment Plot at MERL – It is two weeks since Ella Montt had visited this part of the Plot. The garden had been involved in graduation activity. 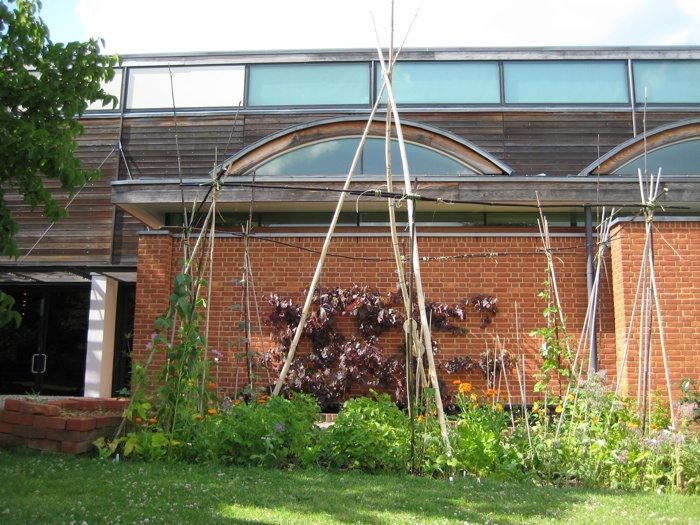 Ella Montt brought black bamboo canes to the Plot, in order to construct a frame that would connect the six smaller bamboo assemblages together. The day was warm, day and there was no chance of rain. The soil was parched. Ella Montt attached the black bamboo canes with stripes of plant material connecting the upper part of the series of six bamboo assemblages. 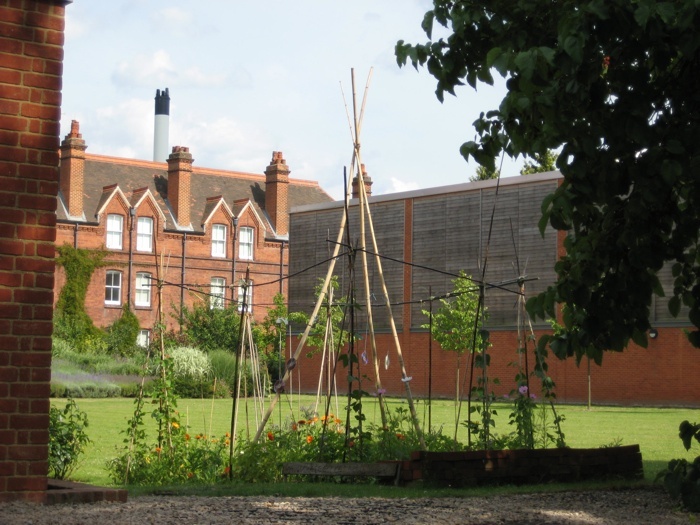 The larger Bamboo Wigwam remained central to the Plot within the frame of the other bamboo. 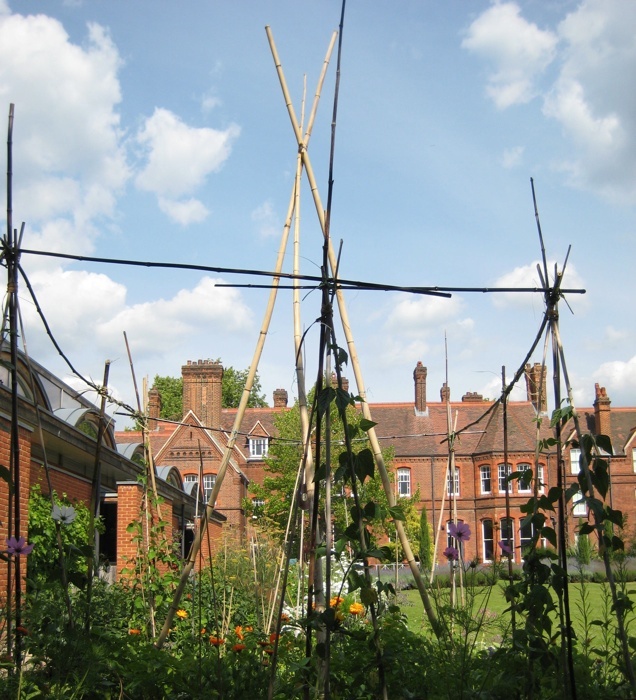 the Climbing Beans at the base of the Wigwam had not yet started to ascend the frame. The plant residue in the Brick Composter had dried out. Ella Montt harvested the Comfrey and Nettle leaves that were growing there and scattered them over the compost as an activator. The other companion plants were flowering, but there was no sign of the orange Cosmos yet, only the pink and white. 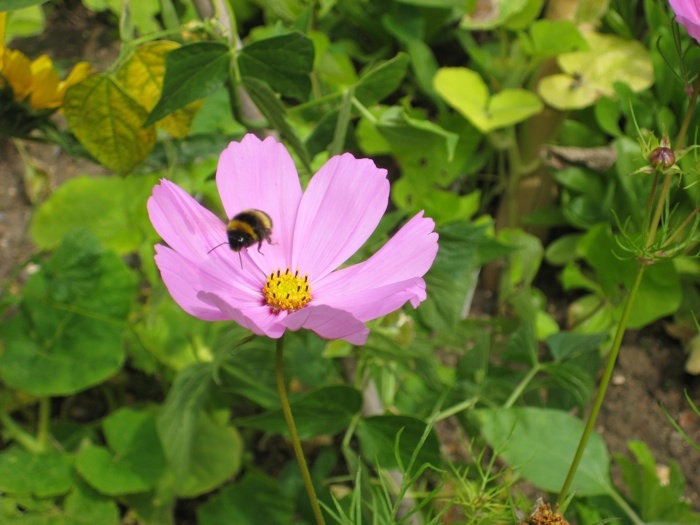 A Bee visited the Cosmos. Nigella (Love-in-the-Mist) was flowering within the Plot although it had not been planted there. The first few Climbing Beans were harvested and a good handful of Wild Rocket. Harvest: an assortment of 10 x Climbing Beans = 2oz = 40g; Wild Rocket = 4oz = 100g. 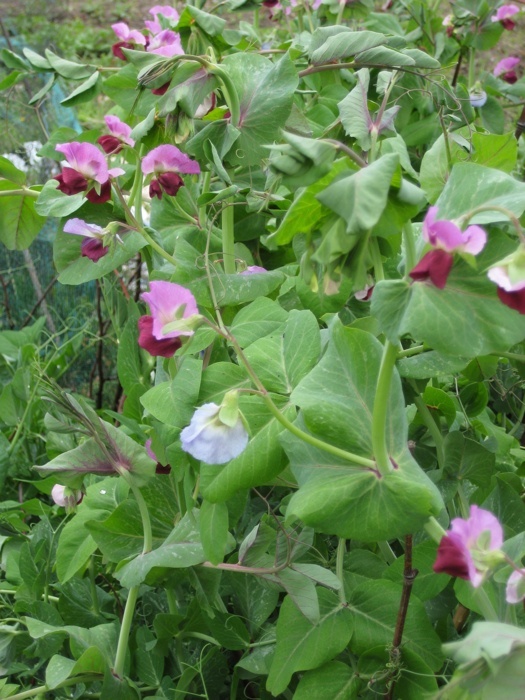 15th July 2011 – Allotment Plot 326 – Harvest: Peas Ezeta’s Krombek Blauwschokker = 1lb 1oz = 480g, Oregon Sugar Pod II = 2.5oz = 60g, a mix of Kelvedon Wonder, Ambassador and Meteor = 8oz = 220g. Unknown beings continued to eat the Pea leaves in a destructive manner. The destruction was viewed by from Ella Montt, but not by the unknown beings, who consumed the Pea leaves as their vital food source, and left the Pea pods undamaged. 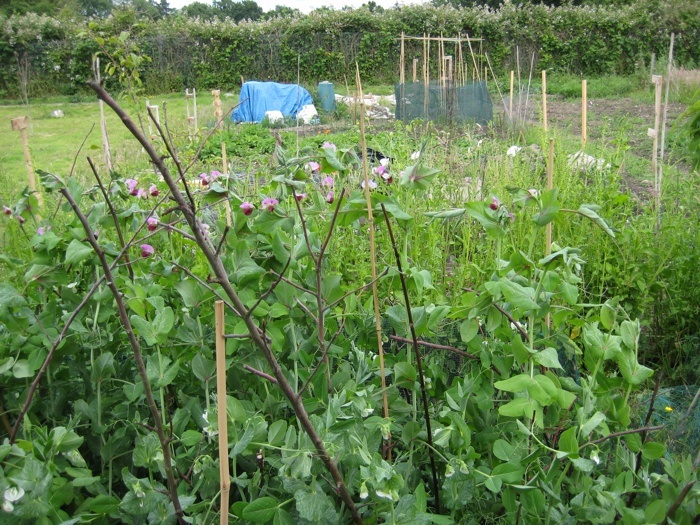 This entry was posted in Allotments, Fence, Frame, Gate, Harvest and tagged Allotments, Bamboo, Comfrey, Fence, Frame, Gate, Harvest, Plot on July 17, 2011 by katecorder. 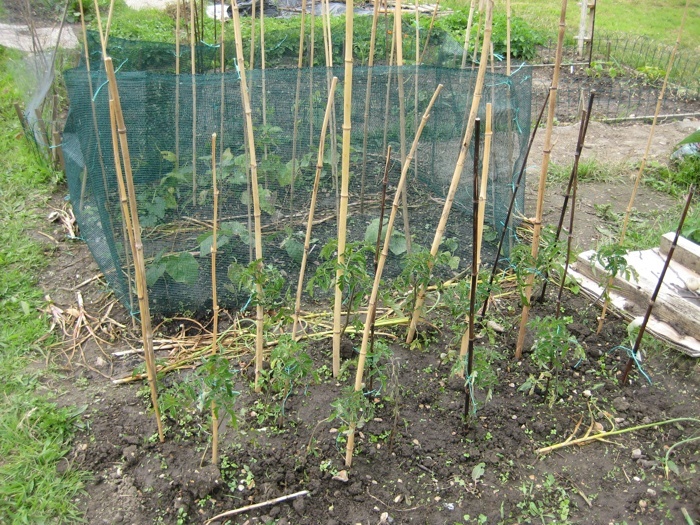 June 20 2011 – At Allotment Plot 326, Ella Montt placed the netting (that she had removed from around the Peas at Allotment Plot at MERL), around the Climbing Beans. A fence around Plot 326 had still not been constructed. A crack had appeared in the Utopian dream. Ella Montt did not have the time to manage every aspect of Plot 326, wildlife was free to roam and eat whatever it liked. 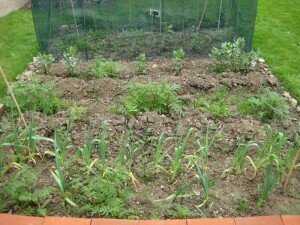 The weeds were growing relentlessly. It will take several years to stop their onslaught. Time, that at this current moment, Ella Montt did not have, so the Plot thickened of its own accord and was barely controllable. Seeds that had been planted with good intent to grow in to vegetables barely made it to seedling stage before they were consumed by an invisible force field that was Nature. 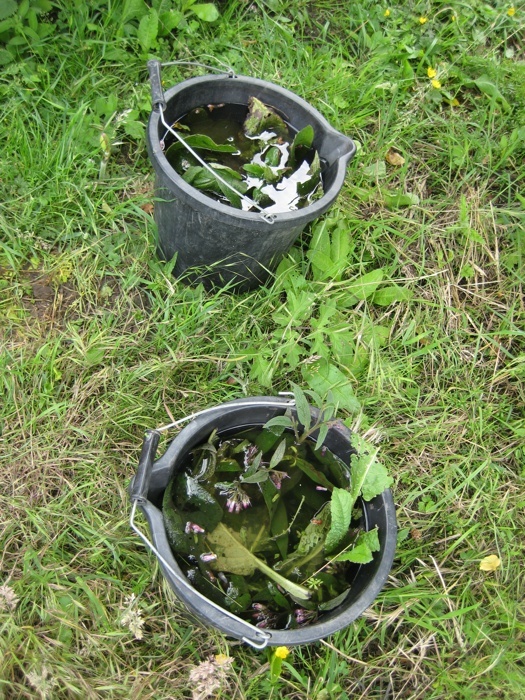 Ella Montt made Comfrey soup in buckets to act as plant food. Left for several days the liquid becomes more than pungent! 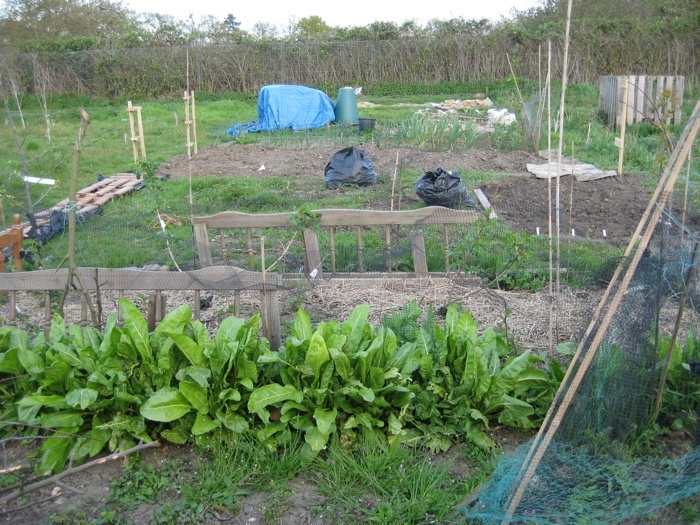 This entry was posted in Allotments, Fence and tagged Allotments, Comfrey, Nature, Plot 326, Seedlings on July 5, 2011 by katecorder. 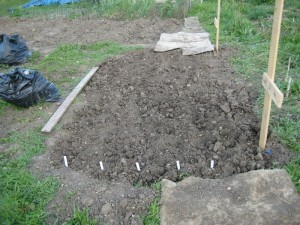 Tuesday 12th April 2011 – At Allotment Plot 326, digging of an area of ground was completed. 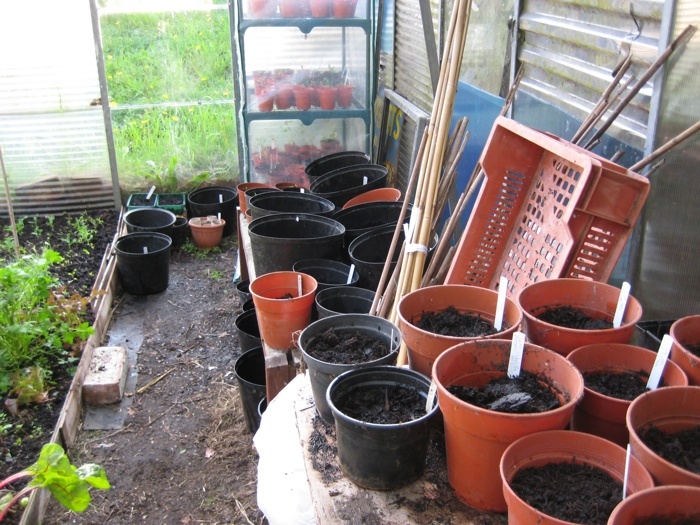 Seeds were then planted as follows: Leeks Almera, Kale Red Russian Curled, Beetroot Bolivar, Carrot Amsterdam Forcing, and Carrot Rothild. Ella Montt noted that both a Carrot fly deterrent barrier and also a Heavy Metal collection of CD’s to deter hungry birds needs to be deployed. Weeding of the overwintered planted area that contains the Garlic, Onions, Spinach, Broad Beans and newly planted Shallots Red Sun commenced. 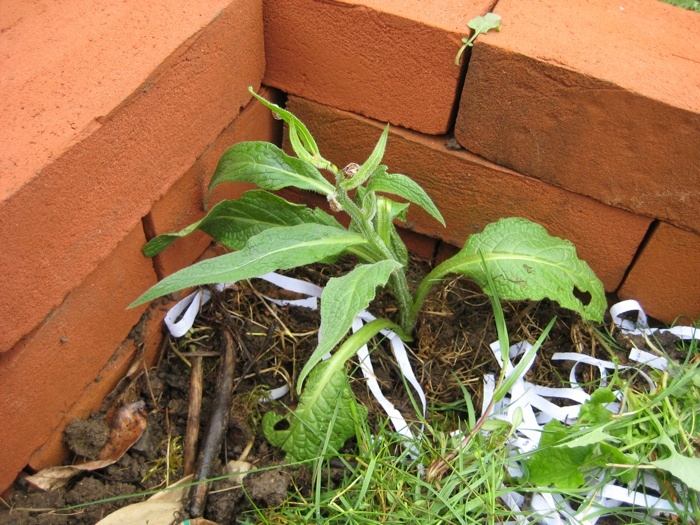 Thursday 14th April 2011 – Ella Montt had acquired a small Comfrey plant donated by ImL. At Allotment Plot At MERL, Ella Montt selected a place in the Plot and planted the Comfrey in the corner of the Brick Composter. A tiny Stinging Nettle plant was observed establishing itself where it had been situated a few weeks ago in the opposite corner of the Composter. Both Comfrey and Stinging Nettle can be harvested as they grow to act as activators to the compost. Comfrey is a good plant food for Tomatoes and Potatoes. Stinging Nettles are loved by Ladybirds and can also be used for human consumption when cooked (much like Spinach). Both plants have their own particular medicinal qualities. The net fence that had been installed around the Peas seemed to have so far prevented bird assault on the young plants. 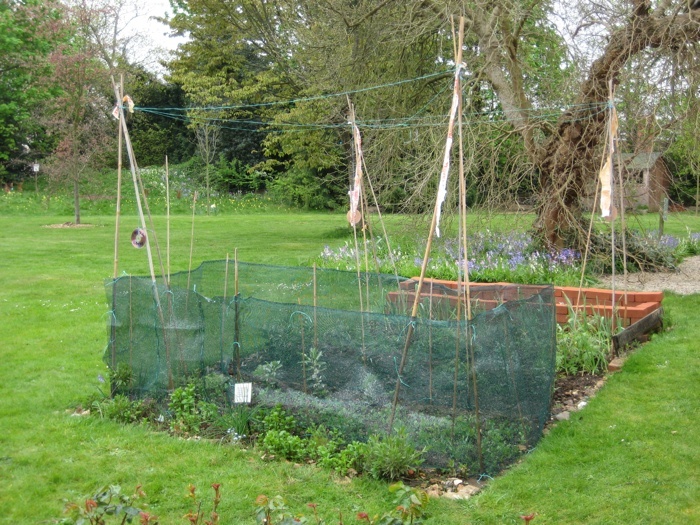 Perhaps the Peas could not be seen through the netting? To try to prevent an aerial offensive green plastic string was tied between the Bamboo tripods. 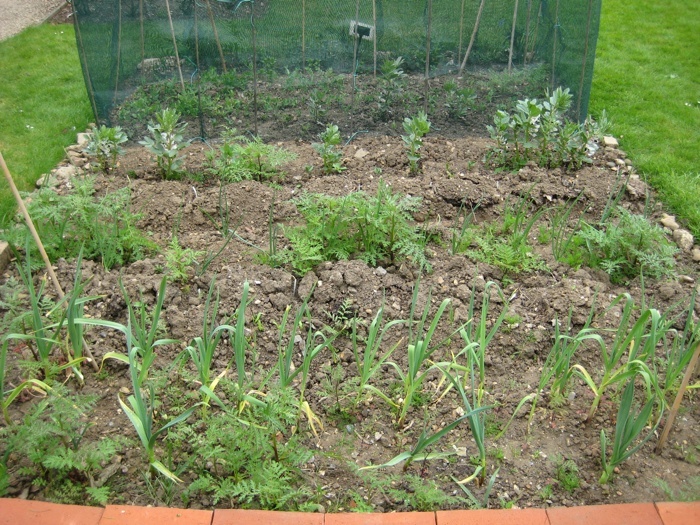 It had rained very lightly the previous evening, but the soil was still exceptionally dry and it was necessary to water the Plot. Ella Montt fetched the watering can from the shed to assist in the watering process. 08/04/2011, Sweetcorn True Gold; French Bean (Dwarf) Royalty; French Bean (Climbing) Barlotto Lingua di Fuoco, Blauhide, Blue Lake, and Neckarqueen, and Runner Bean Enorma. 16/04/2011, Melon Sivan F1; Cucumber Marketmore and Tanja, Courgette Cocozelle, Patriot F1 and Soliel F1; Squash Big Max, Black Futsu, Blue Ballet, Buttercup, Butternut, (Pumpkin) Cinderella, Fictor F1, Green Hokkaido, (Pumpkin) Jack O’Lantern, Marina Di Chioggia, Musquee de Provence, Red Turban and Uchiki Kuri. Last years Beans at the Allotment produced a good harvest, but last years Squashes were slow to grow on the Plot and did not produce a good harvest. This year Ella Montt is taking action to try to improve the fertility of the soil for the Squashes, because the plants like a compost rich soil, but the management of weather conditions to enhance growth development is still under observation and reflection. If drought continues more water will need to be applied. 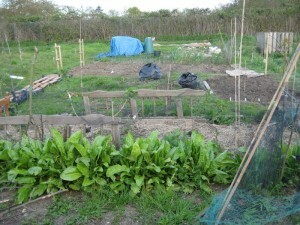 This entry was posted in Allotments, Fence, Plant, Planting, Plot and tagged Comfrey, Compost, Plant, Plot, Seeds on April 18, 2011 by katecorder.